Step 1 In the bowl of a miniature food processor or the jar of a blender fitted with a metal blade, combine the pine nuts, garlic, salt and half of the olive oil. Add the parsley and pulse until the mixture is finely chopped. Scrape down the sides of the food processor and add the celery leaves, Parmigiano, lemon juice and remaining olive oil, and purée. Add more olive oil if necessary to achieve a loose paste. Don’t mix the pesto any longer than necessary as the blade heats up the garlic and may turn the pesto slightly bitter. Taste for seasoning and add more salt or lemon juice if desired. This makes about 1 cup pesto, which can be refrigerated in an airtight container for up to 2 days. Bring to room temperature before serving. In Recipes-list.com we have selected the most viewed recipes from category - Salads . Enjoy the best recipes specially selected for you! 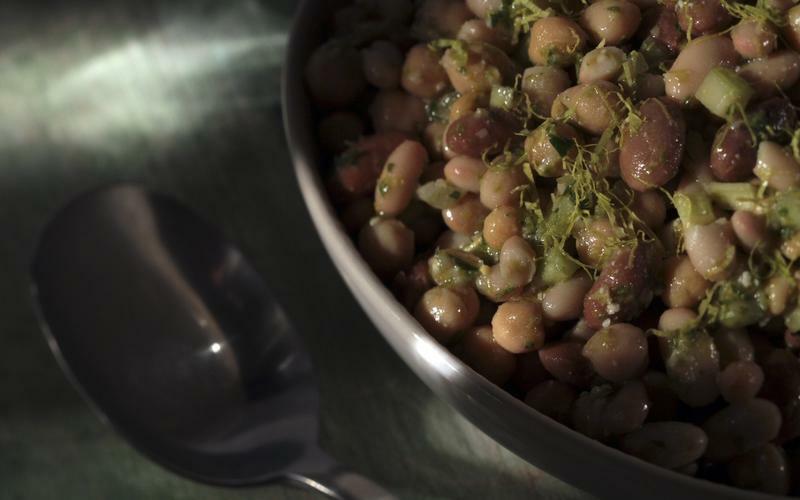 Bean salad with celery leaf pesto is the right choice that will satisfy all your claims.